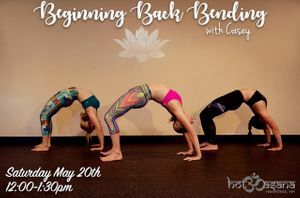 Join Casey on a journey to back bending on May 20th at 12noon. Every pose starts with a solid foundation. Just like a high rise building can not successfully stand if the foundation is weak, it is the same with your Wheel (Urdhva Dhanurasana). Let’s build this pose from the bottom up. Casey will help you integrate all the principals that are necessary to make it successful. You will be able to carry this information with you as you flow into your future classes! Class is 2 hours long, and cost is $20…Sign up now! It will fill up! !